An activity as simple as shaving can get complicated quickly. 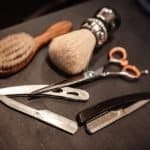 From the different types of razors and type of shaving creams along with either a safety razor or cartridge razor all have an impact on the overall comfort of your shave. 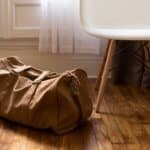 Beyond just the tools, techniques can also play a pivotal role as well. Just a simple misdirection of the razor blade can cause both short and long term discomfort. But even if you follow all the right steps in order to get a close shave, men at any age can get pimples after shaving. Whether you are 17 or 37, pimples that appear after shaving aren’t necessarily sprouting up due to hormones or age related reasons. The core reason why pimples appear has to do with the fact that your pore has been clogged and the mixture of sebum oil and bacteria has formed a white head. 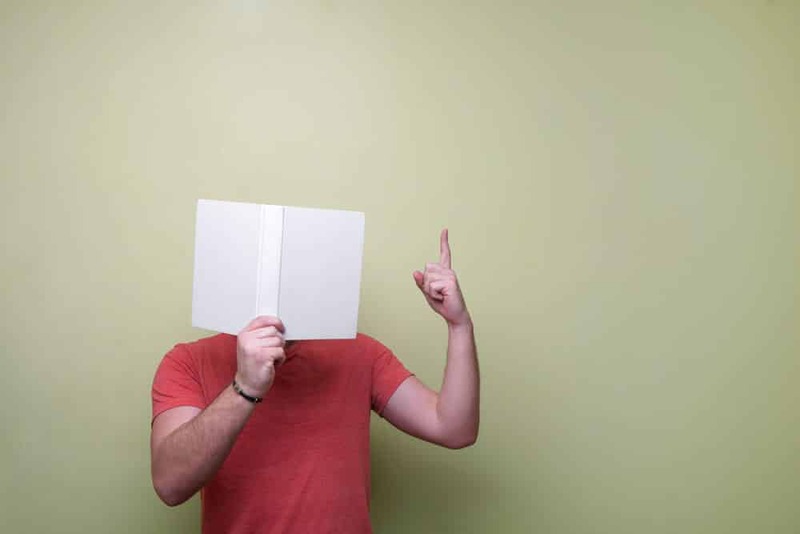 If your skin becomes inflamed, the white head pimples may turn red. 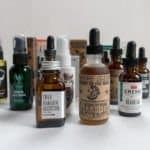 When just doing a bit of searching around Google, you can quickly get lead down the wrong path when it comes to people using the terms razor bumps and shaving pimples interchangeably. At their very core, these two aliments differ drastically. First and foremost, razor bumps occur due to your hair growing inward as opposed to outward from the follicle root. Razor bumps are largely caused by a razor cutting the follicle just beneath the surface of the skin. This happens mainly with cartridge razors as they employ what’s called a ‘lift-and-cut’ technique. What is the ‘lift-and-cut’ technique? The razor blades on these multi-blade cartridge razors work in tandem with one another by having one razor lift the follicle slightly up and second blade follows close behind to cut the follicle. As the follicles go through the lift-and-cut process, they eventually get cut so low that the hair follicle will now rest just below the surface of the skin. Depending on the hair follicle growth pattern, the hair may grow in a non-uniform manner causing a razor bump or on the opposite end of the spectrum, grown normally outwards. To combat these razor bumps, men have used alternative tools to get around this discomfort which we will cover in just a minute. Now if you use a cartridge razor and don’t experience razor bumps at all, consider yourself lucky – you are almost out of the weeds! Taking what we covered above, with the hair follicle just below the surface of the skin, you now open yourself up to potential shaving acne as well. As we eluded to in the opening, the primary culprit of shaving pimples will be attributed to bacteria and sebum oil that is clogging up your pores above the tip of your hair follicle that rests just beneath the surface of your skin. 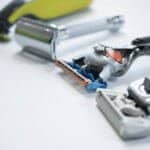 Being that cartridge razors employ a ‘lift-and-cut’ technology that may cause shaving pimples, an alternative would be to use a double edge safety razor. Double edge safety razors, or often referred to simply as safety razors, have been around for years. In fact they were widely popular in the early 1900s when they became part of the standard field kit issued to GIs during WW1. A safety razor is simply a handle with a single razor blade affixed to the end. Their name ‘safety’ was derived from their closed comb (scalloped safety bar) design on the head of the razor. Compared to the razor that preceded it, the straight razor, a double edge safety razor was considered insurmountably safer at the time. Although don’t be fooled – you can very much nick yourself with a safety razor. Safety razors only rely on a single blade to accomplish the cutting of your whiskers – this will mean that no ‘lift-and-cut’ technology is being used. Instead when shaving with a safety razor, to accomplish the same level of closeness that you get out of the best cartridge razors, you need to make several passes with the blade. 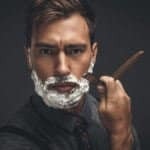 Now if shaving pimples are an ongoing concern for you, which likely they are or why would you be reading this, then you would want to only make either one or two passes with a double edge safety razor. This ensures that the hair follicle isn’t cut below the surface of the skin – effectively reducing the likelihood of pimples after shaving. 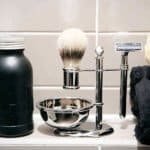 While you might not get that same level of smoothness, the amount of control that you have with a safety razor, will allow you to test different methods and see what is best. 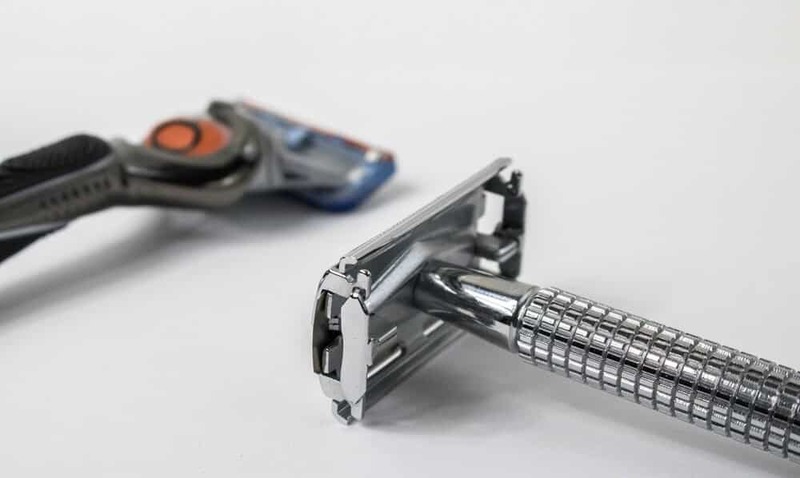 Now if this is your first time ever considering a double edge safety razor, then we highly recommend that you check out our complete guide to selecting the best one for you. 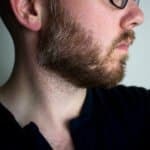 While it shouldn’t be any surprise that a quality shaving cream can make your entire shave routine incredibly comfortable, one often overlooked area by men is the actual application of shaving cream. When men use their hands to apply shaving cream to their face there are a couple of things going on. First and foremost, your hairs are being matted down to the surface of your skin. This means that you are physically pushing the dirt and grime into your follicles as you are prepping your face to shave. Secondly, the matted down movement provided by your hands makes it harder for the razor blade to get a clean cut on the base of the hair follicle which may lead to additional passes of the razor blade on your skin – which can increase post-shave skin irritation and perhaps even shaving pimples. This means that the shave brush will act as a preliminary step to help loosen dirt, grime, and other general pollutants that you might not have been able to adequately shake free while you took your shower. Beyond the pre-exfoliation process, shave brushes also help to stand your hairs up on edge as opposed to being matted down. This will of course make for an easier cut on the hair follicle when the razor glides across your skin. 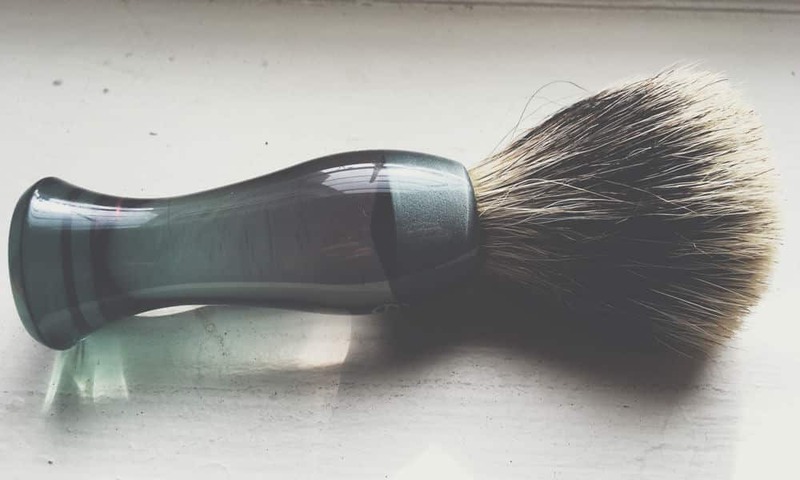 Even if you don’t go all out on an incredibly fancy silvertip badger hair shave brush, just one that costs $20 can make a huge difference in comfort and effectiveness. Check out our full review of the best shave brushes for men. Aftershave balms have several uses, but by and far one of their most desired benefits is the ability to rid any bacteria from your skin once you are done shaving. 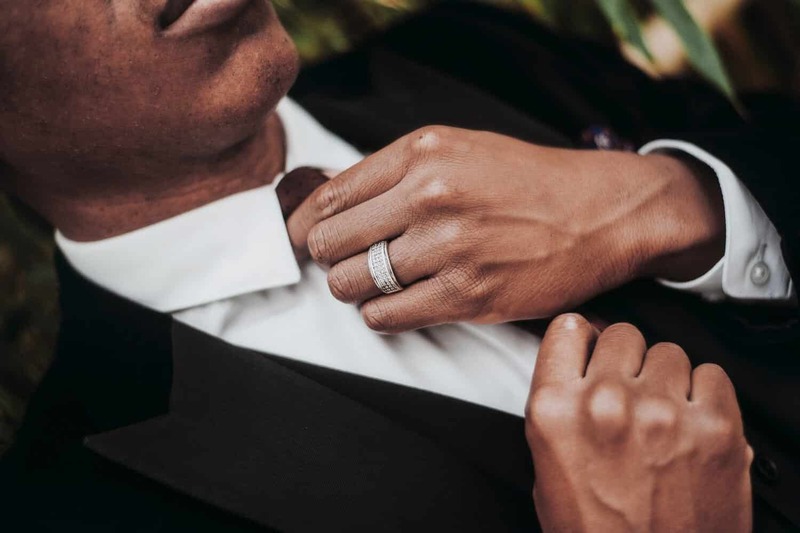 If you aren’t ready to invest in a double edge safety razor, an aftershave balm is a great intermediary step that you should test out to see if it will help reduce the occurrence of shaving pimples. Aftershave splashes and lotions typically contain inferior filler ingredients that do not complement your skin. Most notably, cheap aftershave splashes contain alcohol. This means that not only after application will your face sting profusely if you nicked yourself even in the tiniest of manners, your face will be dried to a crisp post shave. Well if it’s during the winter months, or you just generally live in a more dry or arid part of the country, your face will get incredibly ashy as the day wears on. While there is no denying the antiseptic capabilities of alcohol, there are just simply better alternatives out there for men. Aftershave balm is a careful mixture of typically natural ingredients that will compliment your skins natural oils (i.e. sebum oil). Usually on the side of aftershave balm you will find a mixture of carrier oils that very closely mimic the same healing abilities of your sebum oil. Now you likely are asking yourself, if you apply oil to your face post shave this is going to make shaving pimples worse right?! You see the carrier oils found in aftershave balms actually help to level out your skin complexion. Therefore, in most instances this shouldn’t be a problem for men. Beyond the carrier oils, aftershave balms also contain natural ingredients like witch hazel. While you might be familiar with witch hazel when you made a trip to your local pharmacy, its because witch hazel is used in a variety of products – and it’s completely all natural. Derived from the North American witch hazel shrub, this product when found in an aftershave balm, has properties of being a natural astringent and anti-inflammatory. This means that when its applied to your skin post shave, it will help reduce any irritation through its anti-inflammatory properties along with closing up your pores through the astringent property. It’s this combination of properties found in witch hazel why it’s such a terrific and all natural product that you can safety use after you are finished shaving. Lastly, the other popular ingredient found in aftershave balms will of course be essential oils. While most folks tend to think that essential oils only provide a scent to the aftershave balm, it goes way beyond that. Aftershave balms that showcase sandalwood and tea tree oil are great in that they have natural antiseptic properties. This means that these oils will help to naturally fight off the bacteria that is trying to work its way into your pores and cause skin pimples to occur. Generally speaking, aftershave balms are great to incorporate into your shave routine given its multifunctional use. For full reviews of the top aftershave balms we reviewed, be sure to check out this article. 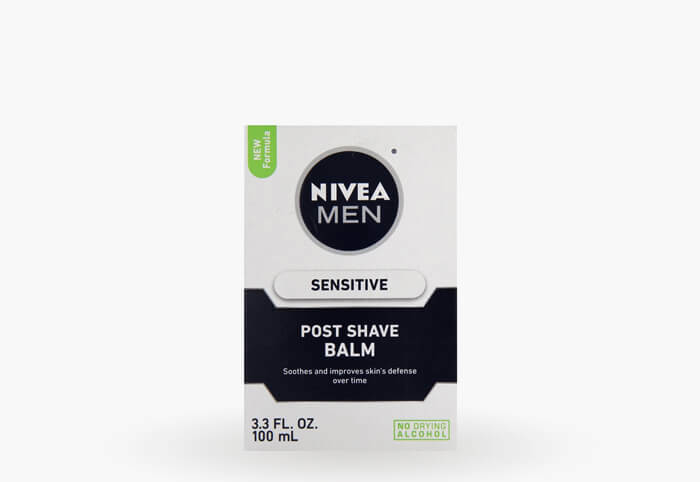 While shaving and aftershave balms require a delicate balance between application and technique, if there was any 100% bullet proof method to never having shaving pimples it would be to never shave at all. Of course, everyone’s scenario is unique in that their job may require you to shave on a daily basis, while other workplaces might be a bit more beard or stubble friendly. What’s great about beard trimmers is that they can cut your hair follicle down to just a fraction above the surface. 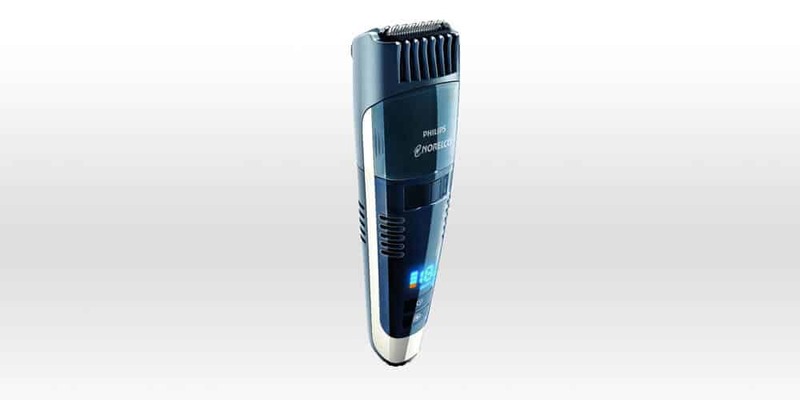 Some of the best beard trimmers on the market can cut all the way down to .5mm. This incredibly close stubble by the beard trimmers will ensure that both shaving pimples and razor bumps can never have the chance to develop. 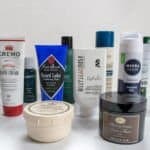 It’s our personal goal to help men across the world to improve their grooming routine. As you saw above, there are several steps that you can take in order to drastically reduce the occurrence of shaving pimples. 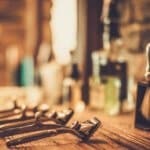 Be sure to check out some of our other great posts about shaving found here.